Wisconsin, Paul married a beautiful and talented coed, Lyda Whicker. enzyme, were driven by the rotation of a smaller internal subunit. 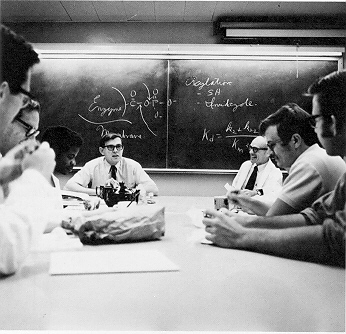 Paul Boyer was Editor or Associate Editor of the Annual Review of Biochemistry from 1963-89. He was Editor of the classic series, The Enzymes. In 1981, he was Faculty Research Lecturer at UCLA. He received the Rose Award of the American Society of Chemistry and Molecular Biology in 1989; Honorary doctorates from the Universities of Stockholm (1974), Minnesota (1996), and Wisconsin (1998); and the Nobel Prize in Chemistry in 1997.